5-10: Carmilla knows a lot of people, she’s like 6000 years old. Nicole has a crush on someone in the band. I’m actually still at SPX. The con is over but I’m here until Monday morning. OMG this is the best con. I met so many cool people and everyone here is super cute and super nice. If you found my work because of SPX thanks for checking it out! Lady in the center is a vampire David Bowie in disguise. Poor Nicole, all star struck. Don’t blame her though. 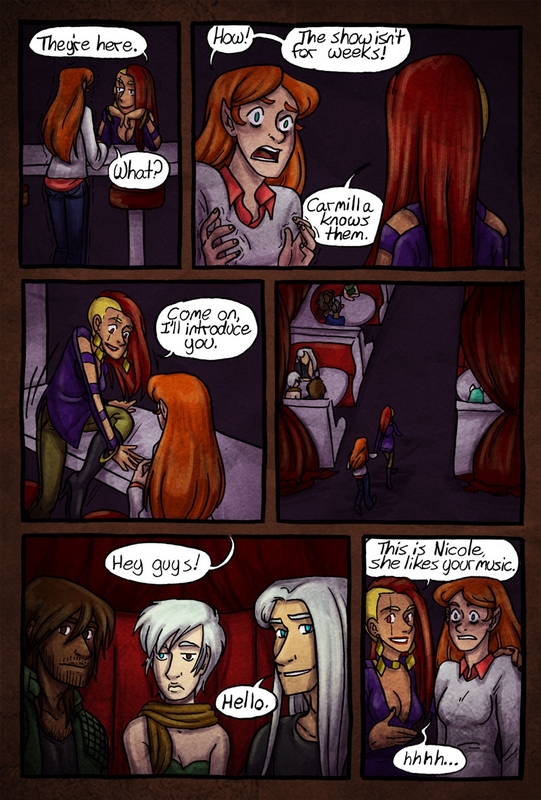 soooo…nicole either has a thing for the hairy brown man, or sephiroth. i’m not considering the one in the middles, she’s super disapproving.